As I celebrate the end of winter and coming of spring here in the northern hemisphere, I decided it’s time to show a little love to some of the podcasts that have helped me get through another season. Of the podcasts listed here, some I consume religiously – every episode, almost as soon as I can get it. Others I pick and choose. Sometimes I’m drawn in by the topic, sometimes by the presentation, but the best episodes (such as these) succeed with the double hook. By now, it’s got to be pretty clear that I really like basketball. One of the many things I appreciate about the current NBA is how much players, coaches and even the league all care about what’s going on in the world around them. This episode of ESPN’s 30 for 30 podcast highlights one powerful example of NBA players caring about the lives of ordinary folks and using their social and cultural capital for good. 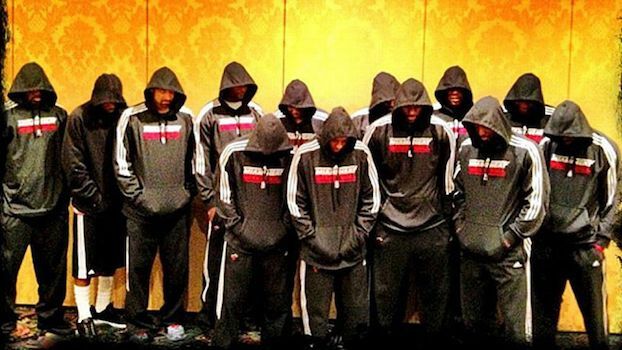 In this story, we hear how the NBA’s Miami Heat ended up posing for a photo with their hoodies up to protest the killing of Trayvon Martin. I like how 99% Invisible uses design as a unifying thread for exploring a wide range of topics. I enjoy the sound of host Roman Mars’s voice but appreciate the team vibe that comes from the various personalities involved. I was primed for this particular story, a two-part history of an Amsterdam suburb called the Bijlmermeer, because I’m intrigued by cities engineered to ‘lead’ us into the future. But the social history here was even more compelling than the architectural narrative. Canadaland‘s Imposter podcast lured me in with the “Hoser” episode, and I’ve learned to admire host Aliya Pabani’s work on the show in general. But this episode on Cadence Weapon has been my favourite by far, especially the sections on diversity – i.e., the lack of it – in Canadian commercial music radio. This story about a man named Hercules, who was enslaved by George Washington, isn’t as brutally horrifying and heart-wrenching as many of the stories about enslaved individuals that I’ve read, watched and heard. And yet it’s a powerful indictment of the vicious selfishness and greed that legalized slavery served. I love history podcasts, particularly history podcasts that explore the stories the textbooks and “heritage minutes” left out. Every episode of The Secret Life of Canada fits the bill, but this one caught me off guard. It’s the kind of story – in this case about Francophone migrant farm workers – that it wouldn’t even occur to me to wonder about before I heard it.